Building on our natural capital is a sound investment. Dangerously low calcium levels in boreal lakes trigger a break in the food chain; native wasps fend off non-native beetle infestations; the last road trip; where cars go to die. Red-headed Woodpecker – A once common species in southern Ontario, sightings of this feisty bird have become increasingly rare. Salamanders – The emergence of these small, secretive amphibians is a sure sign of spring. Spotlight on our donors: Transat A.T. Inc. generously supports our nature reserves system. Hot Zone – Facts and Stats on one of the world’s last wild places. The razing of the world’s forests has turned the marathon migration of our boreal songbirds into a race for survival. Ontario Nature’s reserves provide a much-needed rest stop for tired avian travellers. The sprawling boreal region supports more birds than anywhere else on earth. So why is so much of it turned into catalogues and junk mail? A guide to the great Ontario hawk migration. 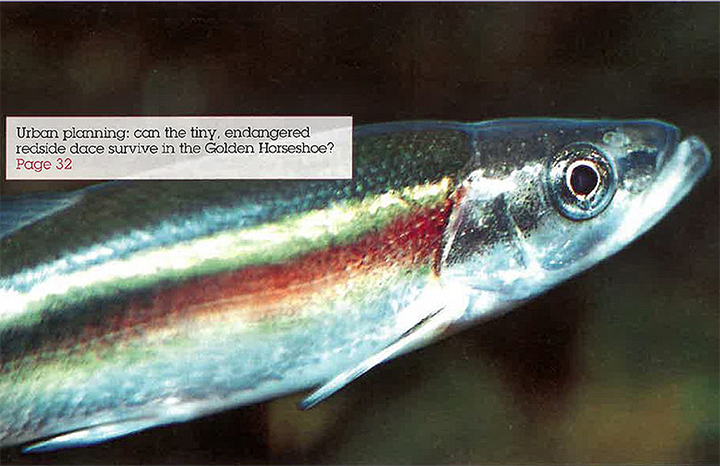 Can efforts to protect an endangered minnow change the way we build communities? Buy a hard copy now.